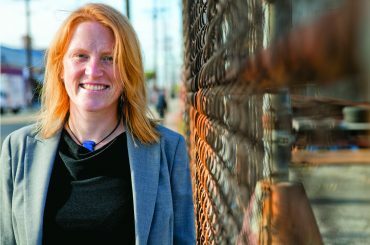 Charlotte Noss joined NELP as our community capacity development manager in May 2017, bringing with her more than fifteen years of experience advocating for workers, organizers, immigrants, and activists in a range of capacities. In December 2017, Charlotte transitioned into the role of director of NELP’s worker center programs. Most recently, Charlotte served as a staff attorney and developed the Latino Outreach Project for the First Shift Justice Project in Washington, D.C. In that role, she worked with community organizations serving the Spanish-speaking community, provided training and assistance to medical providers and social service staff on workplace issues relating to pregnancy, and provided legal advice and representation to low-wage, Spanish-speaking workers on issues of pregnancy and discrimination and other pregnancy-related issues. Prior to her work with the Latino Outreach Project, Charlotte founded the Workplace Justice Initiative, in the Bay Area of California. The organization was dedicated to advancing the rights of low-wage and immigrant workers who are denied justice in their workplace, and Charlotte expanded upon successful models utilizing the law to organize workers. In her capacity there, she also formed the Santa Clara County Wage Theft Coalition of labor and community organizations in the South Bay, in order to assist local governments and agencies with enforcement of labor and employment laws. Charlotte previously completed a Skadden fellowship and served as a project attorney at the Legal Aid Society – Employment Law Center in San Francisco. There, she represented workers in labor and employment claims and served as counsel to the California Domestic Workers Coalition, advocating for domestic workers’ rights, drafting legislation and lobbying for its passage. She was ultimately honored by the Coalition for her contributions when the Bill of Rights was passed into law. During law school, Charlotte was a Peggy Browning Fellow at La Raza Centro Legal in San Francisco. She also interned at Centro de los Derechos del Migrante, a transnational workers’ center in Zacatecas, Mexico supporting guest worker litigation, and with the ACLU-Immigrant Rights Project. Prior to law school, Charlotte spent almost five years organizing in Boston with the Service Employees International Union (SEIU), where she brought union benefits and principles to janitorial workplaces where violations had previously been the norm. She is fluent in Spanish and conversational in Portuguese. College of Environmental Science and Forestry (SUNY), B.S.